SBIG Aluma 814 uses the popular 9 megapixel SONY ICX-814ALG sensor. This sensor has 3388 x 2712 pixels at 3.69 microns square, for a 14.6 mm x 12.8 mm optical format. Aluma Series cameras offer professional performance and features. 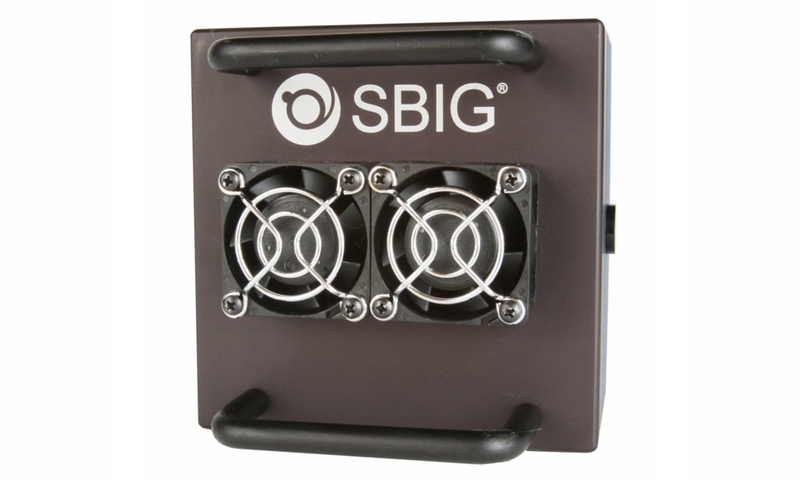 This lightweight (2.2 lbs) and compact (4.5″ x 4.5″ x 4″ with handles) camera includes two-stage cooling, USB 2.0 and WiFi 802.11 b/g/n interfaces, ultra-reliable even-illumination shutter, and fast low-noise readout. Aluma can be operated from a tablet or smartphone, or from a Windows, Macintosh, or Linux PC. The Aluma series supports a wide range of accessories, including the 8-position FW8S-Aluma filter wheel with micron-level filter positioning, FW8G-Aluma filter wheel with built-in autoguider, AO-8A Adaptive Optics accessory, Remote Guide Head, and CLA lens adapters. All Aluma models ship with MaxIm AL for Windows – a special version of MaxIm DL specific to SBIG cameras. In addition our new Aluma software for iOS and Android is under development. Aluma also supports third-party applications through ASCOM and native SBIG drivers. Aluma cameras measure just 4.25″ x 4.25″ x 4.0″ with handles (3.5″ without handles) and weigh just 2.2 lbs (1 kg). All Aluma cameras include a mechanical shutter, which is used for both dark/bias calibration frames and for shuttering exposures on full frame sensors. Rather than using a complex iris shutter, which are prone to failure, the Aluma uses a twin vane shutter and direct drive motor for high repeatability, reliability, and extremely long life. 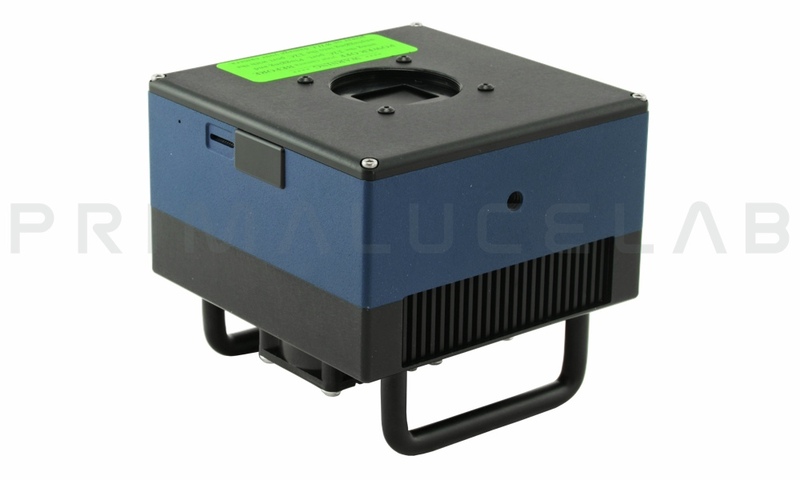 The shutter is designed to be “even illumination” for the best accuracy in photometric measurements. 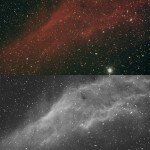 The left image shows a flat field image taken with a camera using an iris type shutter. 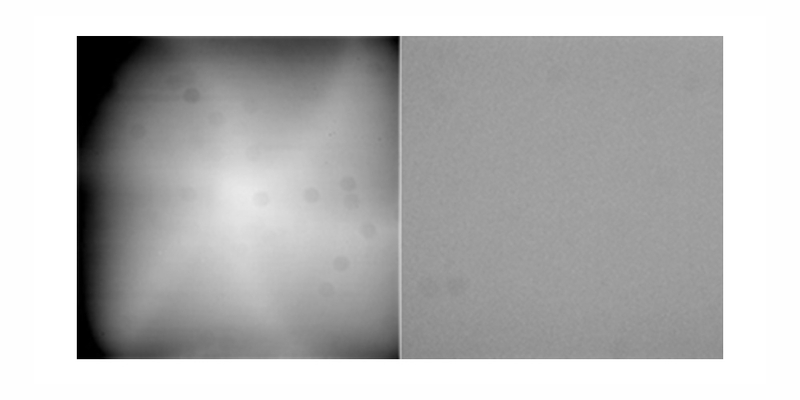 The right image is a flat field image taken under the same conditions using our even-illumination shutter. The Aluma uses two-stage TE cooling, twin variable-speed fans and a heat sink design optimized using computer thermal flow simulation. This permits high performance using air cooling only. The Aluma 814 uses the popular 9 megapixel SONY ICX-814ALG sensor. This sensor has 3388 x 2712 pixels at 3.69 microns square, for a 14.6 mm x 12.8 mm optical format. This is a high sensitivity interline CCD sensor with extremely low dark current and very low read noise. Combining this high-performance sensor with Aluma’s high cooling performance and low readout noise results in exceptionally clean images. This sensor includes microlens technology that concentrates light on the sensitive area of each pixel. 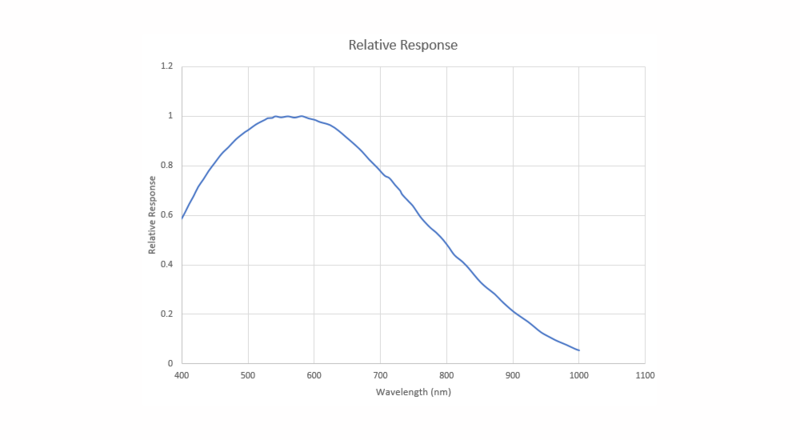 The CCD’s sensitivity peaks in the center of the visible spectrum at 550 nm, and maintains high sensitivity throughout the visible spectrum.